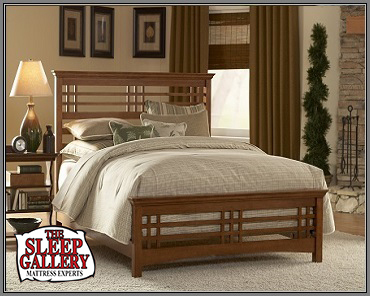 The Sleep Gallery carries a large selection of headboards and footboards to spice up your bedroom decor. A new mattress from The Sleep Gallery brings a renewed energy to your your body without addressing the bedroom decor. This is where a new headboard and/or footboard comes into play, since it can spice up the look of your bedroom quick and for very little money. Some people prefer to use just a headboard and others like to have a matching headboard and footboard. We think either option is great and it depends on what you are trying to achieve with your decor and how much space you have to work with. The most important thing to remember is that the only right way to go is the way you like. We like to present you, our customers, with enough choices to provide lots of different options. And that is why we offer headboards and footboards in all of the standard mattress sizes, and in wood, metal, iron, rattan, for the perfect look. Along with different material options, there are just as many options in the style of the headboards. They can range from delicate woods in light tones to heavy and ornate dark woods with lots of carvings. Or artistic metal designs, or a blend of metal and wood. The options are very accommodating to your taste. You can also get a set that can include bed rails that your boxspring will sit on, but not all come with this setup, so you will want to shop with this in mind if you are wanting this option. As we have mentioned, you can order them in sets or your can get just a headboard or just the footboard. We do this to give you the most flexibility. Most rooms can accommodate a headboard, however a footboard does need a little more room to make it all work nicely. Some footboards can take up six or eight inches, which can be a lot for a small space. We suggest measuring your room so that we can help you pick out something that fits. Ideally, bringing in some photos of any existing furniture, window treatments or other design accessories can make shopping fast and easy, too. You will gain the best results when you keep style and scale in mind when shopping for your new headboard or footboard. We encourage you to come see us to learn more about all of this and more. We are here to help.